For the video Demonstration go to this link and watch 2 videos in sequence to see the machine. The machine has under 50 hours usage and we will provide the serial number and plate info for anyone so interested. it was originally priced at over $3,000. We will not ship, so local / self-pick-ups inquiries only. unit is in great condition, but sale is “as is” ONLY. This does not include information detail on this unit because an upgraded model has replaced it. See next link below for that detail. where you will find the following specifications: The RX-20 is the industries original Rotary Extractor and was designed primarily for truckmounts. 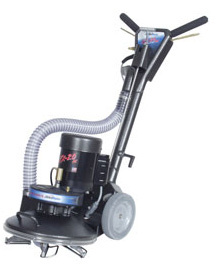 The RX-20 weighs 86 lbs and has proven to be a durable machine over the years. Cliff Monson invented the RX-20 in the 70’s and has since made many improvements to Rotary Extraction technology with the latest line of Rotovac Rotary Extractors. Works great on stains and heavily soiled, matted carpet. Information on the Hydramaster RX 20.